Sign up and receive Property Email Alerts of Houses for sale in Margate, South Coast. This spacious home offering great features such as large open plan living area and bar, wine cellar, granite worktops in the modern fitted kitchen and an entertainment area for all seasons. Enjoy relaxing on the covered entertainment area with a fitted braai and stunning sea views. 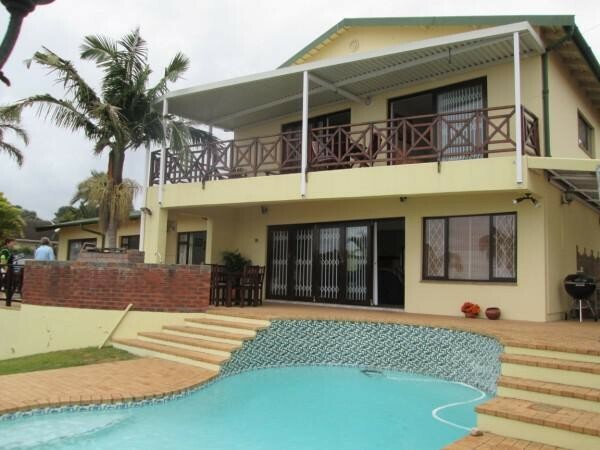 The front entertainment area overlooks the swimming pool, awesome sea views and 2nd braai. 3 bedrooms downstairs and 1 bedroom upstairs, 2 full en-suite bathrooms and 1 full family bathroom. This property alos offers 2 large bachelor flats for the extended family coming to visit for the holidays or supliment your income by renting out for holiday letting. Sign-up and receive Property Email Alerts of Houses for sale in Margate, South Coast.